homify offers lots of exciting modern kitchen accessories and furniture—even modern kitchen wallpaper!—as well as a large gallery of images to help you get ideas. Pictures can even be saved to ideabook to look at later. 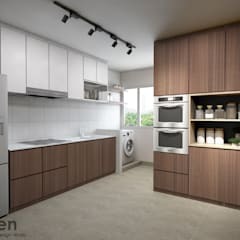 When designing a modern kitchen, there is a lot to consider—style, features, safety, storage—and homify offers solutions for all this and more. 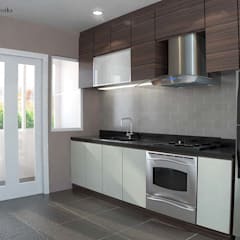 A modern kitchen should be both attractive and functional. 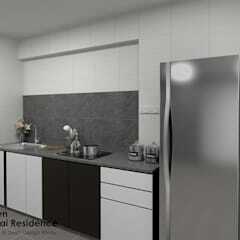 Neutral colours are used in the design—white, beige, etc, but black is not usually used too much. A modern kitchen should have a lot of natural light coming in, should have ample storage space, and should be easy to keep clean. 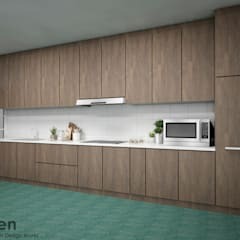 Modern kitchens are never cramped, either—they should be a relaxing, pleasant space that everyone can move around in. Not everyone can afford a kitchen planner, and that's where homify comes in. 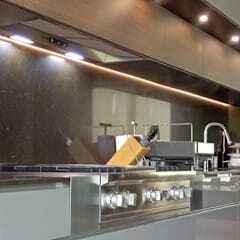 Whatever plans you have for your modern kitchen, homify can offer the inspiration you need to solidify those plans. 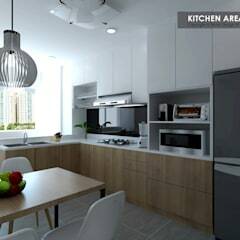 What kind of modern kitchen best suits the style of your modern home—rustic, retro, minimalist? 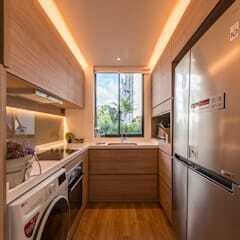 What essentials do you need—dishwasher, spice rack, tumble dryer?—and what would you rather forgo? 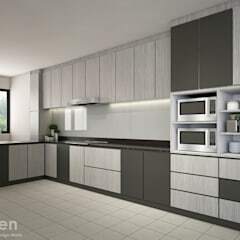 Good kitchen planning finds a balance between the modern kitchen being stylish and it being easy to access and use. 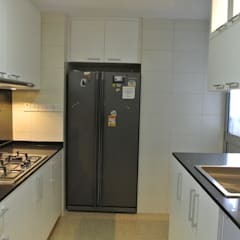 The fact that the kitchen should be a family space also needs to be taken into account—safety features, such as child locks for drawers, may need to be included. 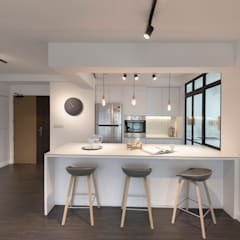 If you have a small kitchen, homify has a wide variety of small kitchen ideas too—placement of units and inclusion of light can make even the smallest modern kitchenlook much bigger. The best modern kitchen will only cost money once—because the design will be timeless enough to never need updating. While some modern kitchen utilities may be expensive, they should also last a long time, and come with warranties in case they break down. Consider your budget carefully and plan accordingly. 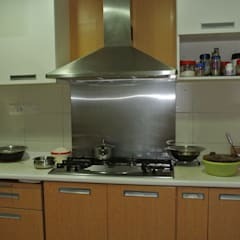 Cheap kitchens can be just as good as expensive ones, if safety and quality are the defining features of the utilities bought. Kitchen lighting can also be purchased cheaply—and don't forget that during the day, the best lighting will come from outside. Position your kitchen furniture to let in as much light as possible. If you're looking to reduce your everyday costs of electricity and water, don't forget to buy machinery with a A+ or higher energy rating! 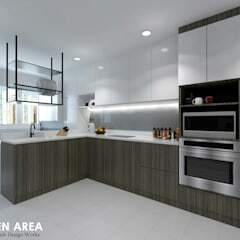 First, you need to consider what materials and colours you would like, and how your modern kitchen will fit into the rest of the house. 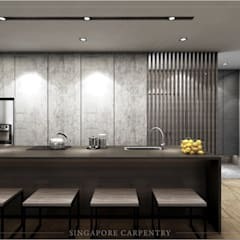 For example, if the rest of your house primarily utilizes wood as a material, using exclusively stone for the design of the kitchen could make it stick out like a sore thumb. Consider that whilst colours can usually be changed easily, fitted things like worktops can't, so make absolutely sure you're happy with everything before it's installed. Also consider the things that will be inside your modern kitchen, and the fact that they may not look as modern as everything else. That's easily worked around, though—an old washing machine, for example, can be hidden behind a stylish door. The most important thing to consider when designing your modern kitchen is—how is it tailored to you and your family? 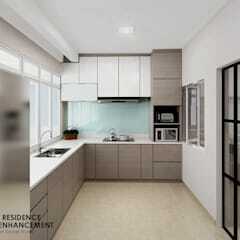 A modern kitchen that is fashionable but soulless won't be the welcoming place a kitchen is meant to be. The best modern kitchens also have lots of space, so start using the vertical space to make room down below—move cabinets higher, and hang saucepans on the wall instead of leaving them on the worktops. 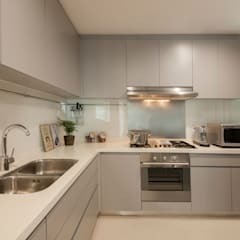 Make sure everything in your modern kitchen is placed appropriately, too—don't place your oven right next to the breakfast bar where younger family members eat, or put potted plants anywhere near a gas hob! 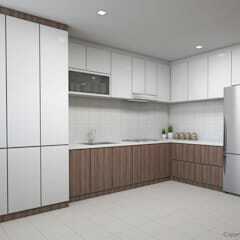 A safe modern kitchen is a good modern kitchen. 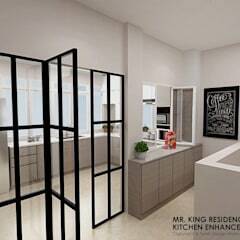 A kitchen island is a unit in the middle of the kitchen used for eating, storing utensils, preparing food and more. As well as being functional, a kitchen island can be a statement in itself—they come in different styles and colours and can make for a dazzling centerpiece to a modern kitchen. 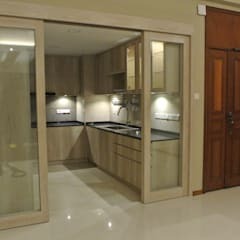 They may not be ideal for very small kitchens, but for large ones they can be an essential component, making more room for family members to sit down and eat and provide a pleasant way of creating a barrier between living/eating space and food preparation space. 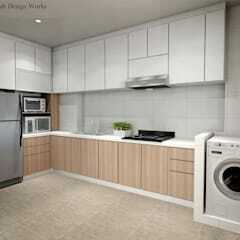 Kitchenettes are small, but that doesn't mean they can't be the centerpiece of an entire space if done right. This is another place where a kitchen island can come in handy—it can break up the space between the living room and the kitchenette. People tend to keep the kitchenette in the same colours as the room around it, but the opposite can work well too—bright colours can make the kitchenette really stand out and be a welcoming space in the home. 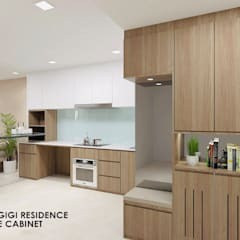 As for storage space, many people choose to use upper cabinets to store things that won't be needed everyday, making more room to move around in the more easily accessible parts of the kitchenette. 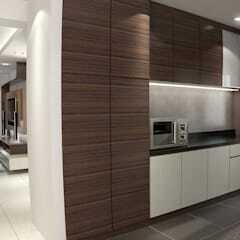 People tend to use things like wood, laminate, marble and granite for their modern kitchen worktop. These can make a great focal point for a stylish modern kitchen, especially if they're in an unusual colour. More inventive ideas such as glass (with lights underneath it for a futuristic look!) and stainless steel have recently sprung to the forefront, but these need very careful looking after or they'll become scratched and faded—and they'll cost money to replace. 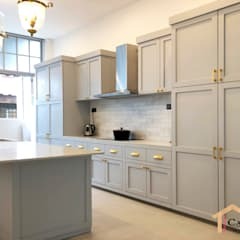 Whether you want to make a DIY kitchen or hire someone to fit everything for you, you need to be absolutely sure you're happy with the placement of everything because it won't be easy to move it! Think about what style of modern kitchen lighting you would like, as well—consider what it will look like with your chosen worktop finish. 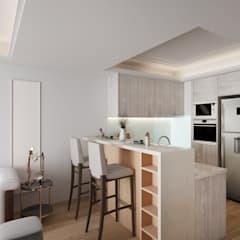 LED lighting options for drawers and cupboards are also available, and these can give your modern kitchen a futuristic, functional look. 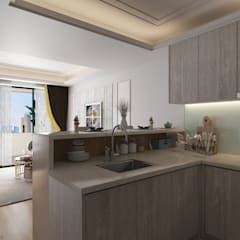 Modern kitchens come in all shapes and sizes now—the kitchenette, the open plan kitchen, the very large kitchen designed for those who cook professionally. But the things they all have in common is that they're attractive and welcoming spaces, with clean lines and an airy atmosphere. Wallpaper is not usually used in amodern kitchen—it can be a fire hazard—but recently special wallpaper designed specifically for kitchens has come into fashion. 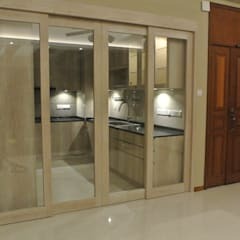 It is also popular to create flowing space between the kitchen and the garden—large glass sliding doors leading straight to the outdoors, for example. Modern kitchens are all about blending seamlessly into the rest of the home—they're no longer just a functional space, they're for living in too. Minimalism is based around the luxury of space. 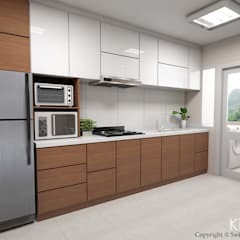 The minimalist kitchen has plenty of space to move around in and store objects, but the minimalist kitchen has space as a feature in itself. 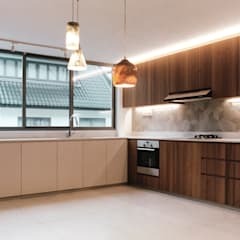 All objects are stored away, often in hidden storage units, until they are needed—there is no clutter whatsoever in a minimalist modern kitchen. Even door and cupboard handles don't stick out much, and everything is easy to clean. People do not usually think of the word 'rustic' when considering the modern kitchen, but it can be done. A rustic kitchen has a lot of light let into it, giving it as 'outdoorsy' a feeling as possible. 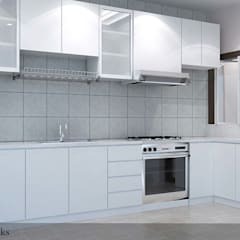 Choice utensils are displayed on the worktops or in cabinets instead of being tucked away out of sight. Industrial style is all about stripping a space down to its bare bones. DIY kitchens often have an industrial air to them—furniture is upcycled, the walls are plain brick, metal is often used in the design. 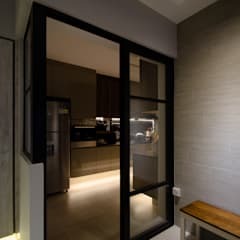 An industrial style kitchen perfectly fits an apartment in a converted building, but might be less appropriate in cosy cottages or spaces where warmth is the key.